Source: U.S. Energy Information Administration and U.S. Department of the Interior, Office of Natural Resources Revenue. Note: The federal government's fiscal year runs from October 1 through September 30, and is designated by the calendar year in which it ends. 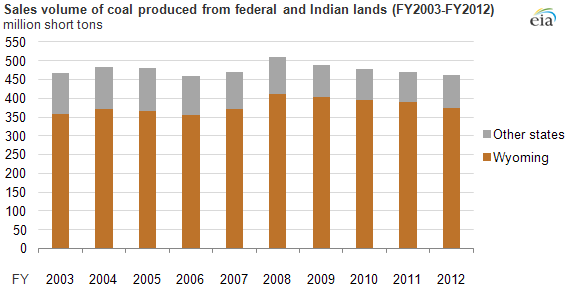 Annual sales of coal produced from federal and Indian lands in the United States ranged between 458 million and 509 million short tons from fiscal year (FY) 2003 to FY2012. Over the same period, sales of coal produced from federal and Indian lands in Wyoming ranged from 356 million to 411 million short tons, 76% to 83% of the U.S. total. Most of the coal being mined in the Wyoming portion of the Powder River Basin (PRB) is being produced from federal and Indian lands; Wyoming mines in the PRB are the largest in the United States. Total production of coal in Wyoming, as measured by the Mine Safety and Health Administration (MSHA), tracks closely with the sales of coal produced from federal and Indian lands within the state, as measured by the Interior Department's Office of Natural Resources Revenue. Using these sales as a proxy for production, Wyoming's federal and Indian lands production has been about 82% to 95% of Wyoming's total production over the past decade. The revenue collected by the federal government from the sales of coal from federal and Indian lands within Wyoming ranged from a low of $303 million in FY2003 to a high of $638 million in FY2012. 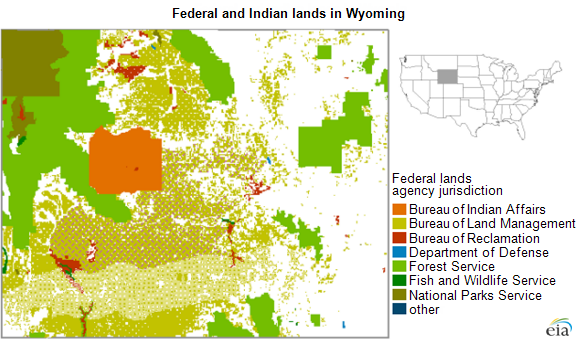 Under current law, 49% of the revenue associated with onshore federal lands goes directly to the state, and 100% of the revenue associated with Indian lands goes to the respective Indian tribes and individual Indian mineral owners. Between FY2008, when coal production in Wyoming was at a record high level, and FY2012, coal production in the state declined 10%. Sales of coal produced from federal and Indian lands in Wyoming declined 9% in the same period. The decline seen in FY2009 can be attributed to the economic downturn that reduced electricity demand. The continuing decline through FY2012 reflects slow growth in electricity demand together with a reduced coal share in the generation mix because of relatively low natural gas prices and growing amounts of generation from renewable technologies, especially wind. Source: U.S. Energy Information Administration based on the Ventyx Energy Velocity Suite.